"Soccer world cup" redirects here. For the women's tournament, see FIFA Women's World Cup. For other uses, see World Cup. The FIFA World Cup is the most watched sport of football (soccer). The Fédération Internationale de Football Association (FIFA) puts together the World Cup every four years. More people watch the World Cup finals than any other sporting event in the world—even more people than the Olympic Games. The most successful team has been Brazil. The finals tournament is held every four years. On the other years there are only qualifiers (qualifying tournaments). These games help to decide which teams will move on. Over 160 national teams play in the beginning games. The best teams from the beginning games win a place in the finals. The finals now include 32 teams. Before 1998, only 24 teams were in the finals. Many years before each World Cup, FIFA picks the host nation, the country where the finals will be held. Being the host nation means that their team has qualified for the finals tournament automatically and does not need to play any qualifying games. The 32 teams in the finals then play for four weeks, usually between June and July, to decide the champion (tournament winner). Miroslav Klose is currently the all-time top scorer of the FIFA World Cup with 16 goals. ↑ There was no Third Place match in 1930, so FIFA decided that the United States finished third because they played better overall in the tournament than Yugoslavia. 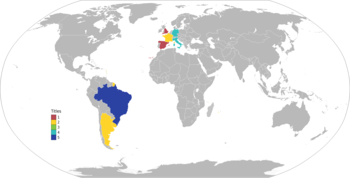 ↑ 2.0 2.1 There was no official World Cup final match in 1950, instead the winner was decided in a final group competition with four teams (Uruguay, Brazil, Sweden and Spain). Urugauy finished top of the league, so they were the champions. Brazil finished second, Sweden finished third and Spain finished fourth. Because Uruguay's last match was against Brazil, this match is often considered the final of the 1950 World Cup. This page was last changed on 21 July 2018, at 08:08.